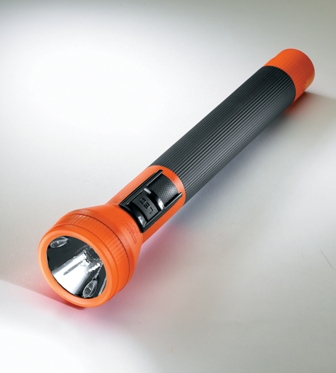 The SL-20XP is a full size professional grade, lightweight, high-intensity, rechargeable flashlight. It features an 8 watt halogen bulb with a 100-hour lifetime; a pre-focused halogen beam of up to 25,000 Candela (peak beam intensity); 145 lumens; runs up to 1.5 hours; and and features a lightweight, super-tough nylon polmer case with non-slip rubber comfort grip. SL-20XP® LED is a full-size yet lightweight incandescent/LED rechargeable that combines the brightness of an incandescent with the extended run time of LEDs — the best of both worlds, it features; 8 watt halogen bulb with a 100-hour lifetime; Pre-focused halogen beam of up to 16,000 Candela (peak beam intensity); 3 white LEDs with 100,000-hour lifetime provide up to 20 lumens; bulb rating is 120 lumens; and a Lightweight, super-tough nylon polymer case with non-slip rubber comfort grip. It will run up to 1.5 hours for halogen only; 11.5 hrs. for LEDs only; emergency backup LED (after full halogen run) = 1 hr. minimum. The SL-20XP LED also features dual switches to select halogen or LEDs and Constant-on and momentary modes.